The 8th International Conference of the European Forum for Restorative Justice will be held in Belfast between 11 and 14 June 2014. 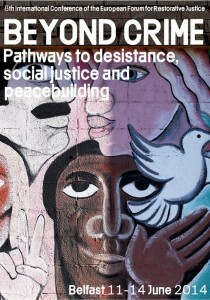 The title of the conference is: `Beyond crime: Pathways to desistance, social justice and peacebuilding`, where social justice is strongly connected to the ALTERNATIVE project. Among the three plenary sessions one is fully dedicated to ALTERNATIVE – Dr. Tove Malloy, the project`s Advisory Board member and Brunilda Pali one of the researchers but also the conceptual developer of this project will present. Besides the plenary, the ALTERNATIVE project will be present during all five parallel workshop sessions, offering paper presentations, dialogues, movie sessions and insights to the action research, involving all partners of the project. Finally, the venue of the conference is also relevant – the ALTERNATIVE partner University of Ulster as local co-organiser will put an emphasis on showing the peacebuilding and restorative justice work they do and aim for in Northern Ireland and more specificly in Belfast.